A compilation of advice articles on how one can make the workplace a more harmonious and accessible environment for persons with disabilities. Inclusion: what does it really mean for people with disabilities? In Singapore, the term “inclusion” gets thrown around a lot when we talk about how people with disabilities should be treated in our society. You can see this term almost everywhere, from ministerial speeches, campaign slogans to companies motto. But what does “inclusion” really mean? Most would paint a general idea of inclusion and say something along the lines of “including people with disabilities equally and fairly in society”. But this begs the question. We all have divergent, even contesting, views on what constitute “fairness” and “equality”. Not too long ago, I attended a focus group session for persons with disabilities to share their views and experiences on social inclusion. Our facilitator asked us to define what inclusion means in employment. We gave generic replies such as fair hiring practices and equal opportunities for career progression. “Equal pay, equal work,” I answered at one point. I wanted to drive home the point that a person with disability should be treated equitably as their colleagues in compensation, professional development and accountability. The facilitator then brought up a hypothetical case study to provoke further discussion on this notion of “equal pay, equal work.” He asked: If an employee with a disability who comes from a lower income household is unable to meet his KPI (Key Performance Indicator), how should his employer remunerate him? Should the employer offer him a salary based on his productivity level, or the same salary given to his colleagues who are doing the same line of work but with higher productivity levels? Much to my surprise, the other respondents supported the latter practice. They even quipped that the company could hire the man to be a “poster boy” for their Corporate Social Responsibility events. I couldn’t help but raise an eyebrow at their response. Didn’t they know that such employment practices only reinforced the negative stereotypes of persons with disabilities as objects of charity? How could it be an acceptable practice of inclusion? To gain respect from a society that prides itself on being a meritocracy, it is important that persons with disabilities are treated as equals, not beneficiaries of a company’s generosity. Anything more would be an insult to his dignity, an act of tokenism which we all know to be a sad excuse for inaction, and a counterproductive measure that reinforces the charity model of disability. If a man’s salary is insufficient in supporting his livelihood, he should seek financial help from the Ministry of Social and Family Development. It is the Government’s responsibility to look after the welfare of their citizens, after all. I’m not sure how others took to my reply, but I know it was definitely not met with overwhelming support. This is understandable. Our background and circumstances, combined with our physiological makeups, influence our perception and thought processes. What may seem like an acceptable practice to me may be unacceptable to others. The question then is how can policymakers translate these multiple and competing views into a coherent set of inclusion policies, particularly one that seeks to protect, promote and support the rights of all persons with disabilities? For a start, the disability community need to come together to reach a common understanding on what counts as “inclusion” in Singapore. For example, in the provision of education for students with disabilities, should special schools continue to exist? If an employee is unable to fulfill his job responsibilities due to limitations arising from his disability, should the company pay him the same salary as offered to his co-workers? These are just some of the tough and debatable questions that need to be addressed. I’m not going to sugar-coat. It’s going to be a complicated, hair-pulling exercise, but it is something I think we all desperately need. Applying for the Open Door Programme (ODP) is easy. I have successfully applied for the scheme and managed to get a lighter laptop for work thanks to the 90% subsidy . Unfortunately, not many companies are tapping onto this scheme because 1) they are not aware of the scheme; 2) they do not know how to go about applying for the ODP; or 3) they think it’s too troublesome. By penning down my experience, I hope to encourage companies who have hired or are interested in hiring persons with disabilities to familarise themselves with the ODP and apply for the scheme. 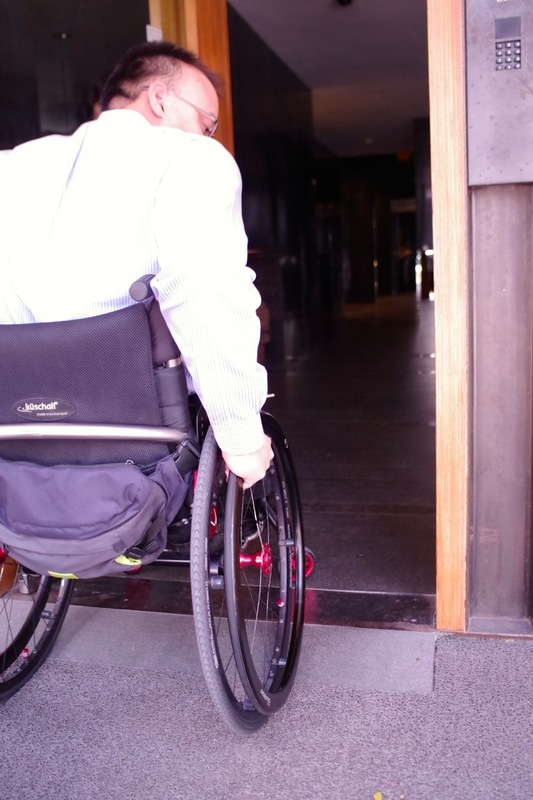 Persons with disabilities may require some form of adaptation or accommodation to assist them to overcome obstacles in their work environment, such as wheelchair access in a narrow office space. Hence you should speak to your employee about the accommodation(s) they might require to perform their job efficiently. Do bear in mind that people with the same disability may have different needs and thus require different types of accommodation. So it is always good to ask, and never assume that what is appropriate for one will be appropriate for another. If your employee is not sure about the type of workplace accommodation he/she requires, seek advice from SG Enable or their job placement/support officer and/or social worker (if they have one). SG Enable may perform a site visit to evaluate their job and work environment so that they can make the best recommendation. An employment specialist will then advise you and provide the relevant information on how you can tap the funding and support under the ODP. SG Enable may also request to perform a site visit and require you to fill out more paperwork. I only requested for a subsidy to purchase a lighter laptop so the application process was really straightforward. All my supervisor needed to do was submit a formal email request that included a description of my disability, purchase rationale and justification, and the cost of the equipment. Depending on the nature of your request, the reply from SG Enable may take a few days. So be patient. In my case, SG Enable replied with an attached application form in their email. They requested that my employer submit the application form along with the original copy of the receipt so that they can reimburse DPA accordingly. The disbursement period took around 6 months. Based on my personal experience, those three steps are all it takes to apply for the ODP. The process may be longer and more complicated for other funding programs such as the apprenticeship program and capability development funding. But do remember that SG Enable is always willing and able to provide companies funding support to make their workplace more inclusive for persons with disabilities. Have you applied for the ODP? Was it successful? Did you find the process easy or cumbersome? Let us know in the comments below! This is a mechanical sleight of hand, or is it a visual illusion? 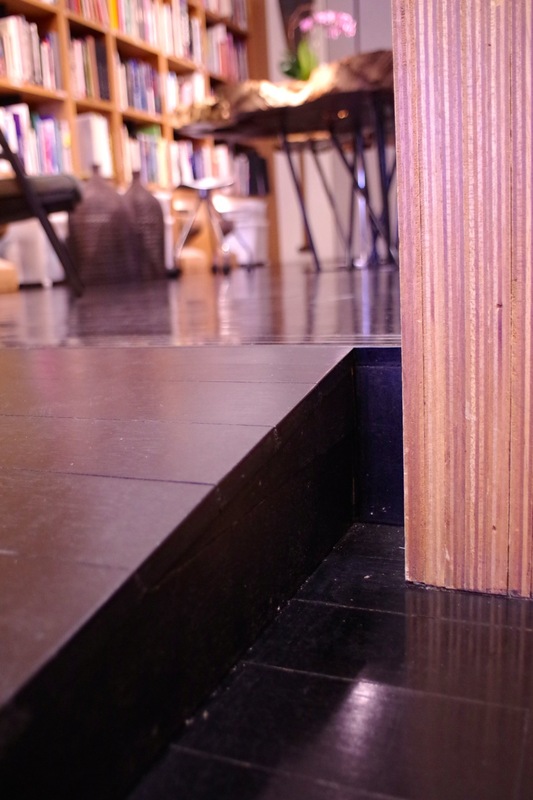 There is a flight of stairs, and then there isn’t – the steps vanish, flattening to a smooth, level surface. You see it happen, you understand, in an intuitive way, how it works, and still it seems magical. DPA got to know about a certain firm’s custom-designed office for one of its staff who has a disability. We reached out to them for a chat and to take a look. This was how, one sunny morning, WOHA Architects came to play gracious hosts to us at its premises. We were showed around the office, which is located in a converted shophouse, by WOHA staff Richard Kuppusamy and Phoebe Tan. Richard, a wheelchair user, is an architect, while Phoebe is the Information Resource Manager. It was especially interesting, not to mention illuminating, to see how WOHA had tackled the shophouse’s unique spatial and design challenges to make it wheelchair accessible. But before venturing there, let’s get to know Richard a bit more. Richard had worked in the United Kingdom for 16 years before moving back to Singapore to be closer to his family. When he started job hunting upon his return, he found obstacles – literal, concrete ones – in his way. 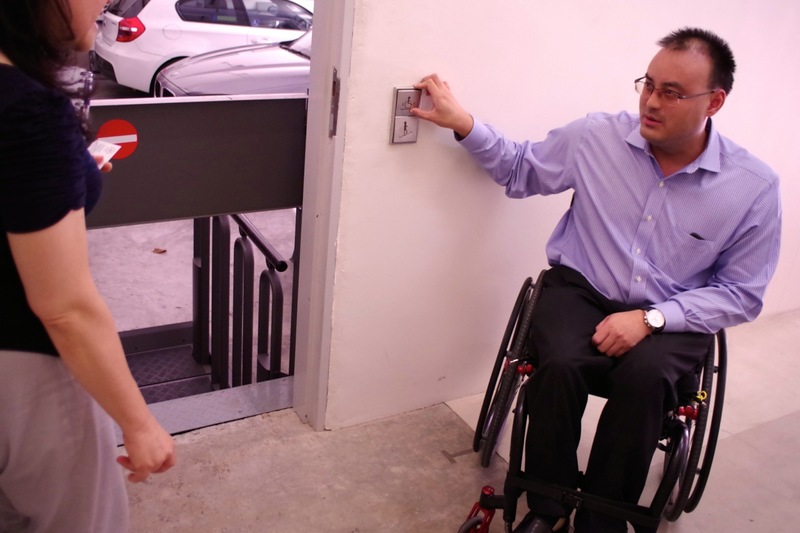 Not only did Richard have to seek an architect firm he would like to work for, it also has to have a door he could actually enter in his wheelchair. WOHA Architects and Richard, fortunately, found each other and they turned out to be the perfect match. The WOHA management was willing to modify the office to make it accessible. WOHA, aptly enough, served as designer and consultant for the renovations, which were done in collaboration with Richard. The end result is an excellent example of “reasonable accommodation” in the workplace. The Importance of Being Reasonable..
Let’s see how the concept of “reasonable accommodation” works in practice for Richard. To him, it does not mean that every part of the office has to be made accessible to him. He feels it is enough that most of the office is accessible, especially the areas he needs to access frequently in the course of his work. He also says it “means that there are no barriers which prevent disabled persons from carrying out their work efficiently and also affording them the ability to excel”. Reasonable accommodation, in other words, is not as overwhelming or as difficult to carry out as we might think. It is about acceptable compromises and balancing the needs of all parties, not about insisting that the needs of the person with disabilities – or any one group – take priority over others’. 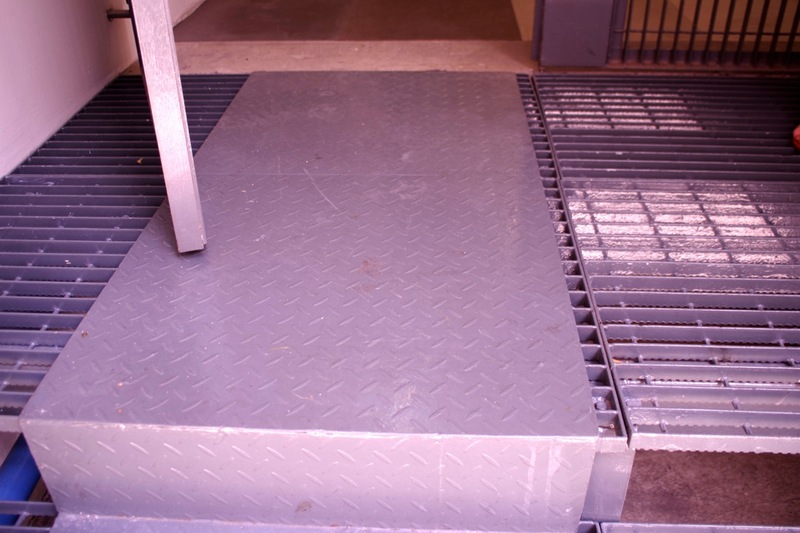 An example: At one level of the office, there is a ramp which is a little steeper than technically ideal, but Richard does not mind as he can still use it comfortably. Making it less steep would get in the way of another colleague’s desk and also make it more likely for others to trip over it accidentally. Too steep? Just nice? Takes up too much space? Tripping hazard? Juggling everyone’s needs is an art. Richard says that if his fellow colleagues have questions about disability or about how to integrate the employee with disability, these questions should be addressed to the HR department. The HR side should have a policy to answer such queries and address any issues arising from having a staff with disability. It would also be good to have awareness/sensitivity training for the employees before hiring the person with disability. Being Inclusive – What Does it Mean? Richard feels employers in Singapore need to make more effort in being inclusive. Small measures can go a long way towards inclusiveness not only in their offices, but in their employment practices. For example, if the office is not accessible for a candidate who uses a wheelchair, they should consider holding the interview at another venue which is accessible. If they then decide to hire that person, they can then go about making the office accessible. Now, let’s take a tour of the renovated, accessible shophouse! Main entrance: The main door is big enough for a wheelchair user to go through easily. There is also a slight slope from the pavement outside leading to the door. WOHA had levelled off the walkway in the front of its shophouse premises to ensure easy passage through to the office entrance or past it to the adjacent buildings. Richard notes that in many cases, the walkways outside shophouse buildings are not level, and also tended to be blocked by various structures such as signposts, bollards and fire hydrants. 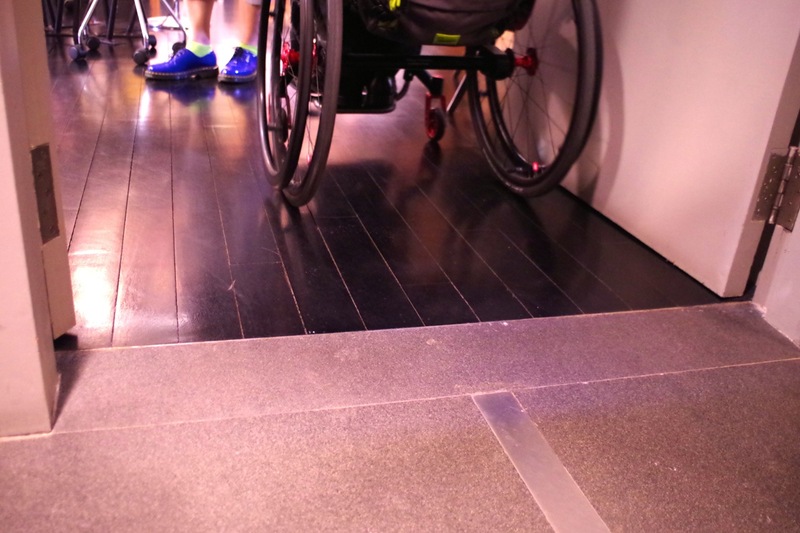 This makes it difficult or impossible for a wheelchair user to navigate freely. 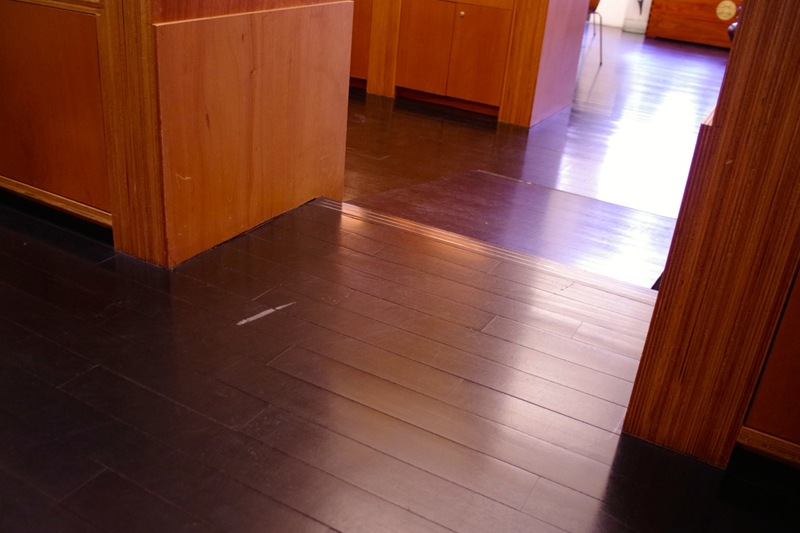 Within and around WOHA’s shophouse office, the floors and rooms are made as accessible as possible. Grilled surface covered up for wheelchair use. Two sets of flex up stairs are installed at WOHA’s office – one at the back entrance and another leading to the meeting room. One floor, two levels, and two ways to access it. Back entrance: As the street level is lower than the entrance to the shophouse, stair access to the building is needed, and so is a lift for the wheelchair. The solution is to have something does both – flex up stairs. Meeting room: As the shophouse is a listed (ie. protected) property according to the National Heritage Board (NHB), certain structural and aesthetic designs of the original building must be retained. NHB guidelines include the provision that the floors have to be maintained at their original levels up to 8 metres inside the building. This is why there are multiple levels on one floor, which means a set of flex up stairs had to be customised for access to the meeting room. Let’s have a look at the flex up stairs in action. Accessibility solutions, Richard adds, should be integrated in a seamless way and not look like an afterthought. This is especially pertinent for a design firm. 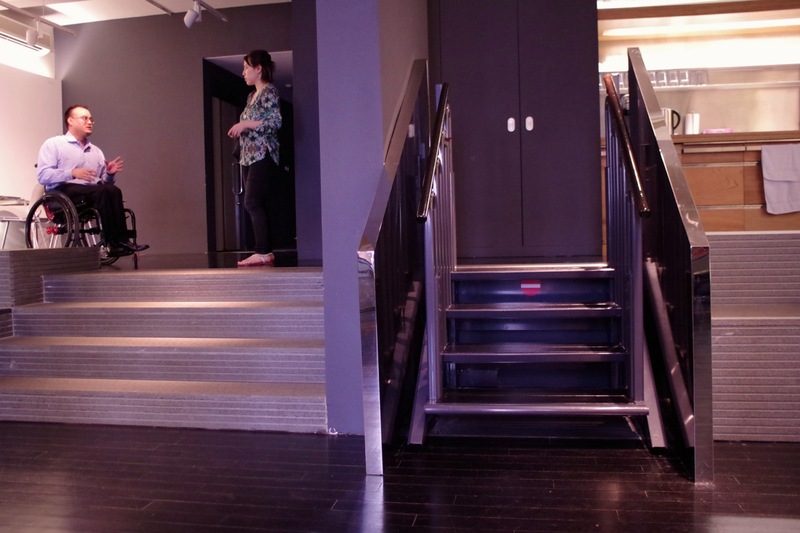 The flex up stairs and design of WOHA’s office is a good example of how this can be done – in fact, the meeting room is available for architecture groups to study as a model of accessible design. Bathroom: The bathroom/toilet door is of a foldable design which takes up less space than a swing door. The door can be opened both inwards and outwards, yet it works like a regular swing door. This type of door is usually used in corridors and is especially suited to the limited space of a converted shophouse. 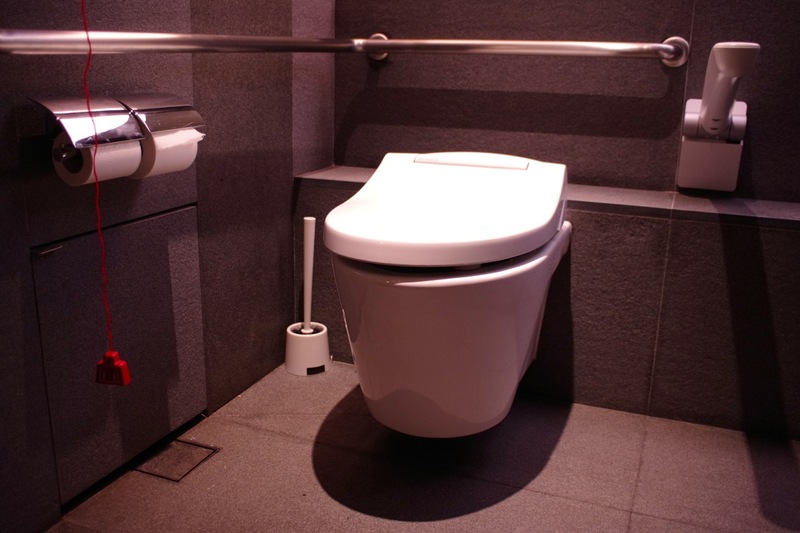 Toilet: Richard feels that the design of toilets should conform to British accessibility standards which promote the independent – rather than assisted – use of the facility. This is what WOHA has done for its accessible toilet in its premises. The current BCA code specifies a sink to be located on the wall next to the toilet, but this poses a problem – it blocks side transfers. (Side transfers from a wheelchair to the toilet is best for most levels of mobility.) The layout in the BCA code, Richard feels, is more conducive to assistants of person with disabilities, rather than for more independent users who do not need help. 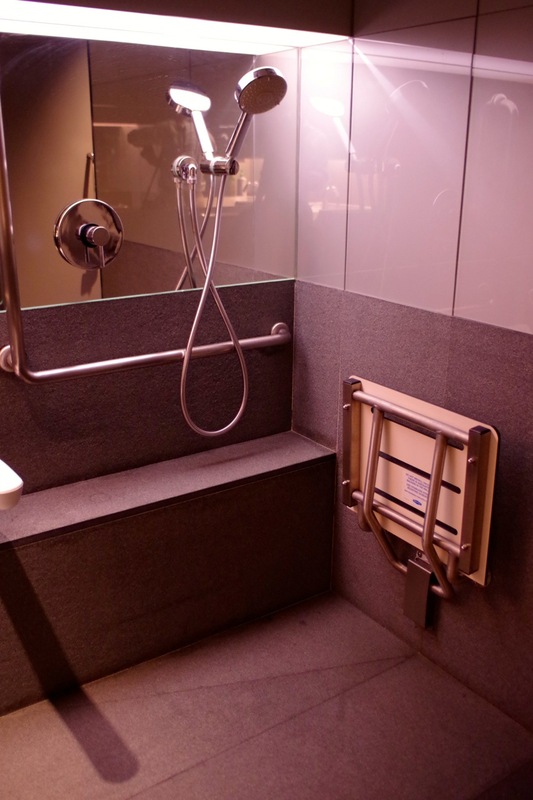 In WOHA’s accessible facility, the wheelchair can be parked beside the toilet bowl itself (the spot where the sink is supposed to be in the BCA code), and the sink is located away and opposite the toilet bowl instead. 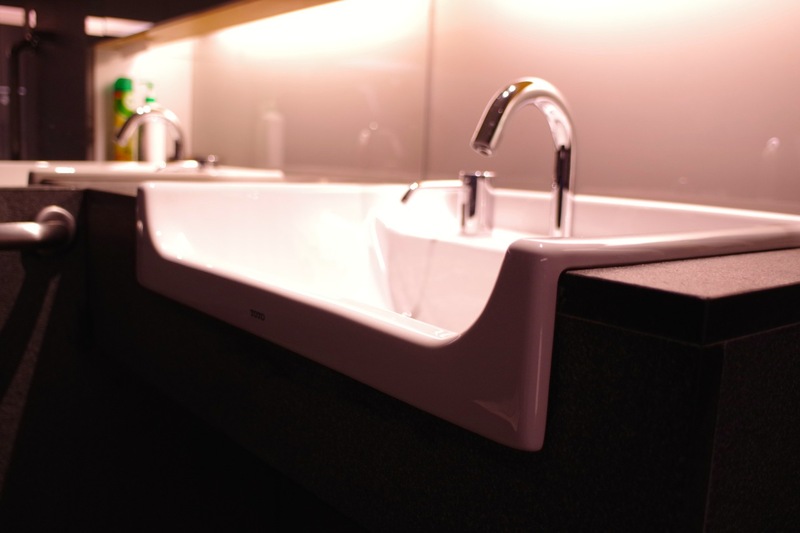 Sink: The sink should be situated so that the wheelchair user can wash his hands before touching the wheelchair again, which makes for better hygiene. The sink has an infrared sensor tap and soap dispenser. The sensor is in the tap end which is more reliably activated compared to other taps with sensors embedded lower down. Other universal design features include: the dip in the front of the sink for the person in a wheelchair to reach the tap more easily; and the ample knee space clearance under the sink. Specialised device.. find out what it is! 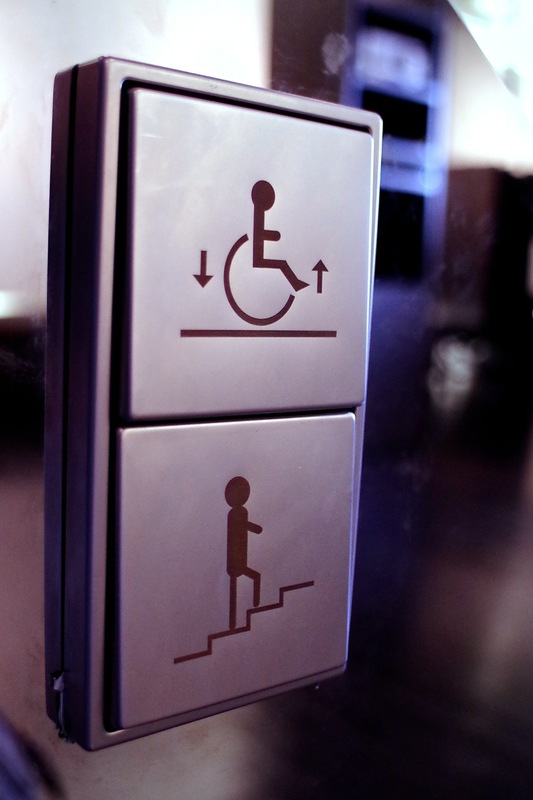 An evacuation plan that specifies procedures to bring wheelchair users or those with limited mobility out of the building safely is necessary in cases of fire or other emergencies. WOHA had gotten in touch with the Singapore Civil Defence Force (SCDF) about the evacuation guidelines and procedures for shophouses. Although the lift is cleared to be operated in case of a fire, firemen would need exclusive use of it. So another method to get Richard down the stairs and out of the building during emergencies is needed – via a evacuation chair. Richard had undertaken some research on the efficacy and suitability of evacuation chairs in the market, as part of a previous research project as an access consultant. He found that widely used evacuation chairs do not adhere to any safety standards, and may be uncomfortable or even hazardous to the user. That is, although these non-certified chairs may help one survive a fire, the user may also end up with other injuries and further disabilities. Another problem is that most such chairs are not designed to be used on a level floor. But as wheelchair users would have to abandon their wheelchairs in the building they are evacuating and use evacuation chairs instead, such devices need to be able to serve as a temporary wheelchair once they have exited the building and before a replacement can be found. 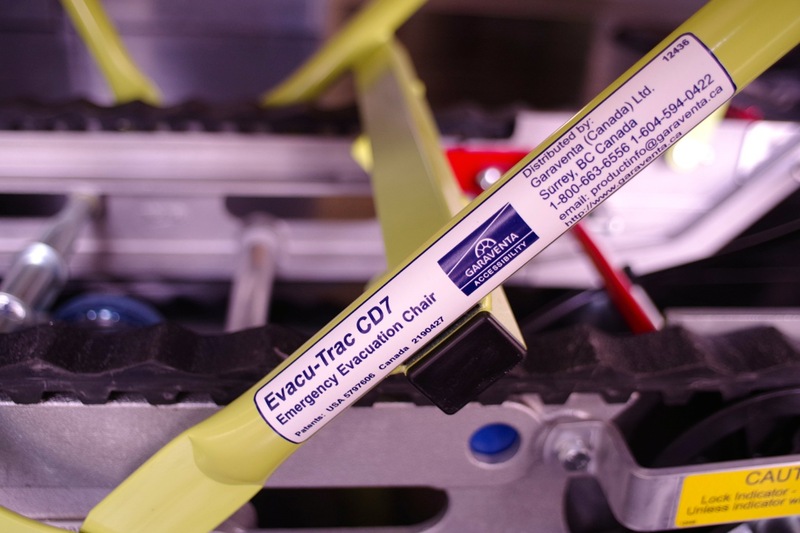 Although evacuation chairs can be operated easily by people of average strength and build, the operators need to be trained to use them because of the limited space it would be used in and safety concerns. To use an evacuation chair, the person is strapped into it. On a level floor, the user will be in a sitting position. When descending the stairs, the user is then in an upright position, but not leaning forward as it would be disconcerting to him. 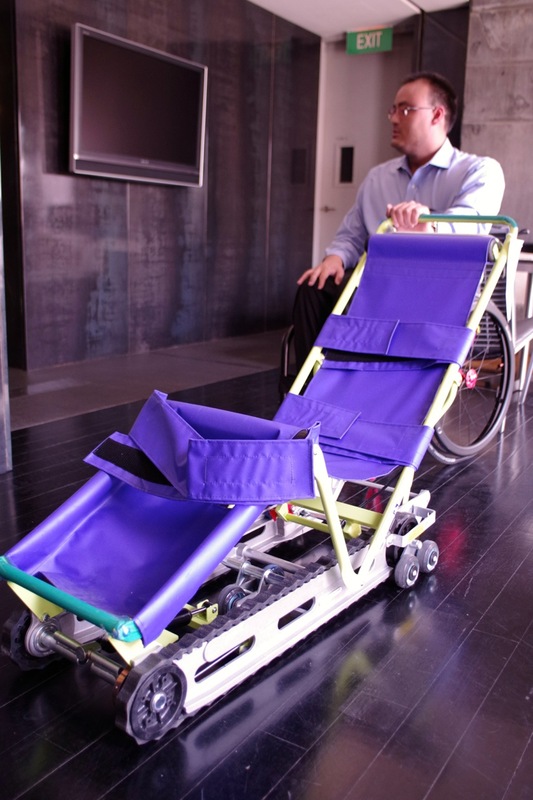 The chair, which WOHA specially imported from Canada, is designed to descend the steps using gravity and the body weight of the person in the chair. It will also automatically stop mid-step if the person pushing it lets go of the lever – a useful safety feature in high-rise buildings where the staircases may be jammed during an evacuation and the human traffic slow moving. Another interesting fact: Evacuation chairs for basement offices are available too. These are motorised, enabling the ascent of the chairs. DPA extends our warmest thanks to Richard and Phoebe for their time, company and sharing! THE Disabled People’s Association agrees with the key points in Monday’s article (“Enabling the disabled employee at work”). The apprehension of employers and non-disabled employees to engage those with disabilities in the workplace stems from three main factors: lack of opportunities to interact with the disabled person; the stereotype that the person is less productive or competent than a non-disabled one; and that any workplace adjustment to accommodate the person’s needs could potentially be expensive or substantial. All these perceived challenges are either misconceptions or more easily resolved than anticipated. Feedback given by disabled-friendly employers has indicated that, by and large, non-disabled employees and bosses are accommodating towards their disabled colleagues and are willing to assist whenever needed. The amount of adjustment or additional effort on the part of employers also tends to be minimal. Businesses that need help in retrofitting workplaces, obtaining special equipment or purchasing technological devices for disabled employees can tap the Open Door Fund. We conduct an inclusion fundamentals workshop for employers. This aims to promote understanding of the diverse needs of people with disabilities and how to accommodate them in practical, sustainable and reasonable ways. In this particular aspect, the public sector should lead by example. Public sector jobs require candidates to declare their disabilities. It would be helpful to clarify the rationale for this and how it affects the disabled candidate’s employment chances at the application stage. Miss Chan Lishan (“A gradual ascent from madness”; Sunday) was reported as having faced much more difficulty finding work in the public sector than in the private sector, which tends not to ask for such personal details. This disparity is especially glaring as her experience clearly shows that her mental illness did not have any bearing on her work performance, as would be the case for most people with such conditions. In the long run, organisations that flourish are those with good employment, health and safety policies for their employees, disabled or otherwise. Foremost among them would be a fair recruitment process based on merit and ability, and which disregards irrelevant factors such as race, age, gender, religion and disability. Read the reply from the Prime Minister’s Office. The answer isn’t so straightforward. You need to assess your own, unique situation. In an equal-opportunity company and disability-friendly work culture, why not? Being frank about your disability and letting your co-workers know what it involves in terms of accommodations at the workplace, and what it means in communicating and moving around, and so on would make things easier both for you and your colleagues. It also helps reduce misunderstandings and misconceptions, especially if the people you work with have no or little exposure to your particular disability. This benefits everyone. 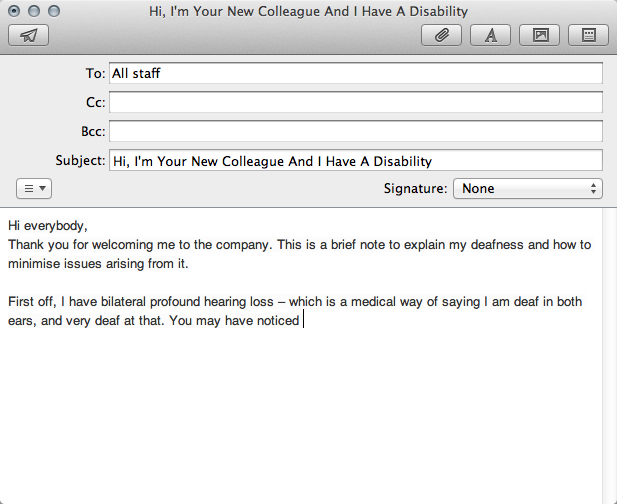 Let’s look at three examples of introductory emails sent by people with disabilities – autism, visual impairment and hearing impairment – to their fellow workers. They have a written record, which they can easily refer to, of your medical condition/disability, and get to know the adjustments they need to make (you will, of course, still need to interact with them face to face). It also saves time and energy by sparing you the tedium of having to recount every detail of your disability/accommodations needed to every colleague/client you meet at work. Note the following are real, unedited emails; only the names have been changed. I’ll like to thank the contributors for granting permission to republish their emails here. And if you wish to do likewise, do adapt the emails for yourself, and not copy it wholesale. Disabilities occur on a spectrum, and it is highly unlikely the contents of the emails fit your circumstances perfectly. You may also want to structure your email this way: Who you are, position in company, your disability (what it means in medical, social, communication, etc terms), what accommodations you need, tips for working better with you. It had been a great first month for me in our big family. I am very happy you invited me to lunch sessions. I like all of you friends! You allow me, a greenhorn, to add on the business know-how and daily updates of the world in general. I am also really excited with the jokes I laugh at – I am sure you share my excitement. I think most of you like the way I smile and cheer up your day. I do consciously know, though, that I may ‘feel’ weird. I may behave like a spoilt brat or a loafer. I seem to daze around often. I may speak to myself at the desk. I may be easily distracted by the smell of food or loud sounds. I may repeat a few words unintentionally and unknowingly. I may unknowingly interrupt others while you are engaged in some interesting conversation I would like to join in, but not really adept enough to join in. Also, in work, despite what I learnt in school, I may find it difficult to follow instructions if it’s not clear-cut – something essential in our line of work. I may need you to repeat instructions over and over again. I am not really misbehaving. I do not choose to misbehave, even though I try to. I have autism. Autism is a difference I have. I may not be able to interact or socialize the way most people do. It is just me. I try to do my best doing what is best for my job performance. I keep trying. However, with the fantastic support I received in this company, I am sure I will have a fruitful time with the company. I am Aimei. You probably have met me before. I thought I take some time to write to you to explain some things about working with me. I am Visually Handicapped or Visually Impaired or Visually Challenged or in very simple words, I’m blind. I am unable to read print so giving me a piece of paper with words in an enlarged font won’t help. I will appreciate that all materials can be in the soft copy format so I can read with the aid of my screen-reader installed on my laptop. Unless the printer/copier talks, I won’t be able to operate them by myself. Next, to get my attention, either tap me gently or call my name. This will be especially helpful if you need me to speak, just looking at my direction has no effect on me. Likewise, pointing and gesturing won’t work. Be more precise when describing. Try to avoid “It’s here”, “Over there”. Letting me know position of things relative to the surrounding things is very helpful. “The button is next to the emergency button, to its left”. “The cupboards are to the right of the wall” etc. Most of the time, I won’t know who I am speaking to so you might like to identify yourself as an introduction. A “Hello” or a “Hi” is not really enough for me to recognise you. Please don’t move the furniture around. I need to use them as a reference point. If there is really a need to move them, please let me know. At the same time, please do not move items which are on my table. Talking about using objects as reference point, don’t worry if I purposefully walk into objects like wall/plants/pillar and what have you. When my white cane hits them, my mind is processing the information I am given so I can decide how to proceed from there. You can offer your help by giving me verbal instructions or nudging me to the right way if I veer off course. Usually, just let me try on my own. I am very grateful whenever someone is willing to guide me. Gently make contact with the back of my hand so I know where is the offered arm. If the place we are walking to is quite narrow, bring the arm which is guiding me behind your back. In this case, we are walking in a single file. Do provide me with audio cues like “We are turning left/right”, “We are going up/down some steps”. I can either walk up/down with you or you can let me follow the railings. Put my hands on the back of the chair so I can find the seat. For chairs without a back, put my hands on the seat itself. Please inform me if you need to step away for a while. If not, I might end up talking to myself because I cannot see you walking away. Thank you for welcoming me to the company. This is a brief note to explain my deafness and how to minimise issues arising from it. I wear a big ear piece, otherwise known as my cochlear implant. This implant helps me to hear sounds better. Unfortunately, the sounds I hear are not exactly the same as the sounds heard by people with normal hearing. Mine is a somewhat degraded version, with quite a lot of fidelity loss, so sounds/speech are not always comprehensible to me. That is, there are certain sounds in the human speech frequency range which I can’t catch, or my brain can’t understand or interpret properly. So much for the theories. What does all these mean in practice? * Sometimes, I can’t catch you the first time, or the second, or even the third. So I have to ask you to repeat what you say. * I must maintain eye contact with you or, at the very least, be able to see your face in order to understand what you say. * I only understand English. All four tones of Mandarin, and all nine tones of Cantonese sound similar to me. Eg., dumplings or sleep (shui jiao) have the same mouth movements and sound the same to me. * Get my attention first before starting a conversation with me. If I don’t respond to my name, feel free to wave or stand in front of me (of course this does not apply to certain situations like…. when I’m using the toilet). * In a quiet room, on a one-to-one or small group basis, face to face, I do best. If you need to embark on a long, complex discussion with me, this is the ideal environment. * If I repeatedly can’t catch what you say, rephrasing your sentence may help. Simple gestures and pointing, if possible, also are useful, especially for numbers or directions or sizes, etc. * To make up for my non-existent phone skills, email or SMS me. Or if you wish to talk, just let me know, and I’ll be happy to go over to your desk. * If I sound unintelligible, please don’t be shy, and ask me to repeat. I’ll speak slower and concentrate on speaking clearer as well. Do feel free to ask me if you have any questions.